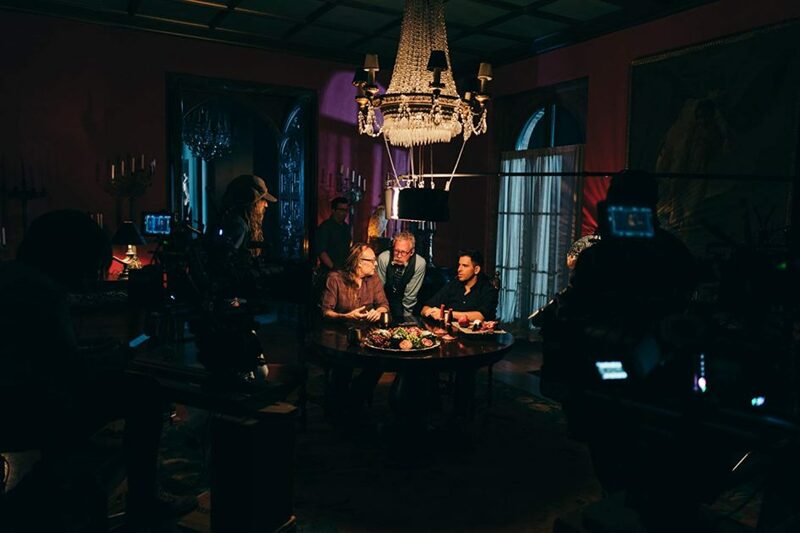 Rob Zombie watches on as Greg Nicotero and Kurt Sayenga discuss Zombies with the host on Eli Roth's History of Horror. Photo by Bret Curry. Greg Nicotero, Norman Reedus, Ernest R. Dickerson of The Walking Dead (with Chris Hardwick) discuss their show’s popularity and some of the reasons the public has made TWD cable’s highest-rated series that just happens to be based on horror themes. Satire, consumerism, realistic special effects, societal collapse, American values, race, the American class system and conquering death are all discussed by actors, writers, filmmakers and film critics, as Zombies, as a topic, are a catch-all metaphor that are featured in all types of movies within a variety of genres. Nicotero, Max Brooks and surprisingly, John Landis have a lot to say, discussing the end of the world, the fall of society and Zombies being the sign of anarchy throughout the episode. Writers Stephen King, Diablo Cody, Victor Lavalle, Joe Hill and Amanda Reyes add their two cents and the episode is lively, which is ironic, discussing these undead creatures. Slow vs. fast-moving Zombies are debated (which I love to always see!) and I was surprised to see the primary topics flowed down the line of George Romero’s groundbreaking undead franchise films, getting perspectives by many filmmakers, writers and scholars alike. Romero basically created the rules for killing Zombies almost 50 years ago, appearing here in past recorded interviews, discussing his original film as being a claustrophobic nightmare with sociopolitical points. Taking a nod from James Cameron’s Story of Science Fiction, Eli Roth’s History of Horror airs on Sunday late nights during AMC’s FearFest, paired with new episodes of The Walking Dead and Talking Dead, but this great program should air nightly, instead. Horror fans are used to staying up late at night and these episodes could and should be airing every night during the week of Halloween. Instead, this show will air weekly throughout October, wrapping up on November 18, practically venturing into Thanksgiving territory. That just feels like a HUGE missed opportunity that should be tied to the seasonal horrific holiday. Ironically, Rob Zombie doesn’t speak too much during the “Zombies” episode, but he seemingly has much more to say during tonight’s “Slashers” episode. Well-timed to air during the weekend of Blumhouse’s Halloween release in movie theaters, I look forward to seeing both slasher episodes, as well as the ones featuring demons, vampires, ghosts and killer creatures. Each of those topics could easily feature a who’s who list of top filmmakers, historians and writers, so it’ll be tough to wrap up enough of each one within an hour-long episode. I only wish this was an annual docuseries, instead of just a limited series. AMC Studios is really creating some great entertainment these days that isn’t just limited to The Walking Dead. I can’t wait to see what will air next on the channel.